Last Week This Morning: 2018 legislative session starts Monday! Josselyn January 7, 2018 Last Week This Morning! Sign up for the #DoubleTalkDucey Thunderclap! On Monday, we’ll be fact-checking Governor Ducey’s State of the State speech live on Twitter and Facebook, using the hashtag #DoubleTalkDucey. We want to see the hashtag everywhere, and we need another 16 people to sign up through Thunderclap to promote the event on social media. Sign up here! Join us in person on Tuesday in Tucson! On Tuesday, Ducey will be at the Tucson Convention Center giving a Tucson version of his State of the State address. Join us, Mi Familia Vota and Indivisible Southern Arizona outside the convention center from 11 am to 1 pm as we speak out against #DoubleTalkDucey! See all the details here. The legislative session starts Monday…do you know who your legislators are? If not, it’s a great time to find out — look it up here! Save Our Schools March: Saturday’s March to Save Our Schools was HUGE — congratulations to the amazing folks at Save Our Schools Arizona and to everyone else who helped put it together! Check out our Facebook live video from the event here. Shooter loses it: On Friday, a reporter asked Representative Don Shooter some questions about the sexual harrassment allegations against him and the reaction was…something. Check out the video here. 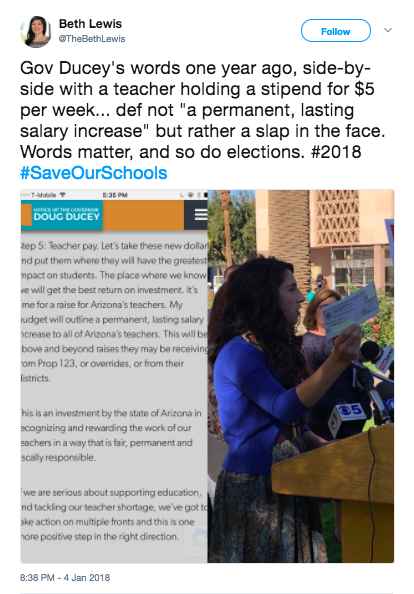 A roadmap for funding Arizona’s schools: Earlier this week, the AZ Schools Now coalition issued their 2018 call to action, which included a list of funding sources that the legislature could use to provide hundreds of millions of dollars in new and permanent funding for our public schools. The options are out there — we just need our elected officials to use them! See the menu of options here.